Fairport resident Bernie Rick, 78, works at Advanced Safe & Lock because he experiences such a thrill each time that he opens a safe. “People are concerned about their valuables and protecting their family and businesses. I enjoy helping people,” Rick said. He discovered his passion for picking locks when he was 12 years old. His father was a locksmith in Buffalo; he was the oldest of 13 children. By the time he was 16, he was opening safes. “The day I opened my first safe, I knew the bug had bit me,” Rick said. When Rick was 19, he paid to participate in a manipulation course presented by Sargent & Greenleaf in Rochester. The S&G President Harry Miller and Vice President Jim Taylor recognized Rick’s talent and approached him to open a precision safe and lock company in Rochester. This led to the creation of Security Safe & Lock at 512 W. Main St. in 1956. The business expanded next door to 510 W. Main St. as Security Safe Co. in the 1960s. The company became Security Safe, Inc. when Rick moved the company to 1000 E. Main St. in 1971. In 1986, Rick kept rights to the name Security Safe, Inc., and sold the company. By that time, the business had 25 employees and seven trucks. “Most of the locksmiths in Rochester today trace their roots to Bernie Rick. He either trained them or their teachers personally,” said John Mallette, vice president of Advanced Safe & Lock, Inc.
After selling the business, Rick and his wife, Blanche moved to Florida, where he was employed in the Financial Services Division of Allstate Insurance. “I knew I still had safes in my blood while I was living in Florida. Once, I went to a locksmith meeting in Orlando and told the participants to call me it they had a safe they couldn’t open. I’d open it for them,” Rick said. He received about a half dozen calls, including a request to open a big portable bank vault. He moved back to Upstate New York five years ago due to sickness in his family, and, reluctantly, resigned from Allstate in Florida. He became a day trader, but he found that boring. He decided to find some part-time work and approached Advanced Safe & Lock, Inc., at 1459 Lake Ave. in Rochester. This company was founded in 2005 in Webster and acquired Town & Country Locksmiths, Inc. in 2007. Town & Country had been serving Upstate for 20 plus years. 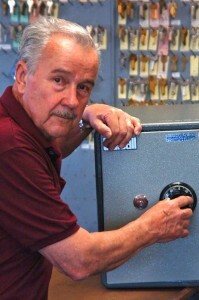 Advanced Safe & Lock’s team has than a century of combined experience locking out crime and opening safes. “I like teaching the young guys. I want them to learn the trade. I spend a lot of time explaining how and why the work is done a certain way,” Rick said. “At Advanced Safe & Lock, we want to attract apprentices who can learn from skilled lockmasters like Bernie Rick and Joel Snell,” said Frank Cicha, president of ASL. On July 21 Blanche and Bernie Rick celebrated their 57th wedding anniversary. He has a son and two daughters, six grandchildren and five great-grandchildren. He lives in Fairport. Call Advanced Safe & Lock, Inc. 585.254.5140 To arrange a free security check up!